Uke-waza is the skill of protecting yourself against being struck by an opponent and it also represents an integral part of the overall curriculum of old-school karate-jutsu. For those of us who study and teach old-school karate, the Uke-waza practice is commonly referred to as, „The Quadrant Drill.“ This is because of the geometrical way with which we look at such a unique set of practices. Punching, kicking, and striking represent the principal kinds of blunt-force-trauma attack scenarios, most frequently experienced in one-on-one empty-handed encounters of physical violence. Because we understand which anatomical targets are most frequently attacked, and what kinds of attacks are most commonly used, this unique practice better prepares us to recognize the angle of entry and protect ourselves accordingly. The quadrant drill methodically recreates seventeen of the most vicious attacks, where the fists, feet, elbows, knees and head are used as the principal tools of impact, in one-against-one self-defence scenarios. Using about a dozen different ways to protect the seven most vulnerable parts of the body there are a total of twenty-nine strikes in the overall drill. Once a time-honoured practice in history of this art, the habitual acts of physical violence represented the original contextual premise against which all fundamental fighting skills were tested and established. By methodically recreating those violent attack scenarios, which most threaten our safety, we too are better able to discover, understand and employ the application templates handed down through kata. Ironic as it may seem, however, this catalyst-like component has been largely forgotten in the modern interpretation of karate – and yet, it is this one obvious and indispensable mechanism that makes it all work. In level 1 of Uke-waza, Tori [the aggressor] attacks Uke [the receiver] with a total of twenty-nine individual strikes. Beyond satisfactorily receiving the strikes, and protecting himself, Uke is not required at this point to follow-up with counter-responses. The entire purpose of Level 1 is simply to become familiar with the various attacks, understand body position, spatial distance and the angle of entry along with providing an adequate defensive reception for each strike. Ive broken down the twenty-nine strikes into eight smaller groups of three and four techniques, and presented them several times during the first lesson in order to best learn and remember the order in which they are delivered. Throughout the entire routine, Tori and Uke both use only passive resistance in order to build confidence while at the same time promoting a safe learning environment. As the lesson progresses, I fuse the techniques together into a single drill and present it from several different positions in order to get the best vantage points for learning. Using the same techniques of reception against the twenty-nine strikes, level 2 introduces Uke to a practical set of prescribed counter-responses in an effort to continue building and strengthening the effectiveness of the quadrant drill. Like all other drills in KU, the response practices featured here represent a cross-section of the most practical reactions under these common circumstances. In no way, however, should these prescribed counter-techniques, or any other prescribed KU practices for that matter, be seen as the only responses to such habitual circumstances, but rather accepted as interchangeable concepts strengthening the overall functionality of this practical mechanism. Continuing to explore the variations on this common theme, level 3 helps Uke effectively deal with being seized and shoved up against a wall while being struck by those techniques most frequently exampled in circumstances such as this. 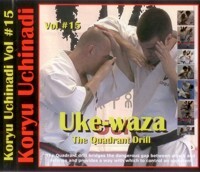 Enhancing our ne-waza practices, as exampled in DVD vol 14, level 4 of the quadrant drill features effective ways of receiving various punches and strikes if and when on the ground with an opponent on top of you. A forgotten aspect from this arts early origins, level 4 represents an indispensable component of KUs overall self-defence mechanism. Uke-waza stands on its own as a highly effective independent set of drills, i.e., the methods of receiving various impact-related attacks, and their prescribed counter responses, can be effective deterrents in self-defence without the need for additional measures. However, a firm believer in preparation, and leaving nothing to chance, „it just makes more sense to have a complete toolbox and never need all the gear than it is to consider the alternative!“ As such, the quadrant drill works best when used in conjunction with the rest of karates old-school methodology. Simply put, the quadrant-drill is the common thread, which weaves together the comprehensive fabric of old-school karate. I am confident that such thinking is far more in line with the original intent, approach and teachings of the pioneers than is the conformist mentality, which advocates style and form over function. The opportunities made possible with this web-like network of reception & response practices are simply endless. In addition to the many hours of rewarding training this mechanism is sure to deliver, I am confident many new and exciting doors of discovery will also open before you. The beauty of this kind of training lies not entirely in the obvious testing of oneself, or the physical conditioning it promotes, but also in discovering that what brings all styles together is more important than what separates them.this is the spirit of the art, and this is the soul of karate.